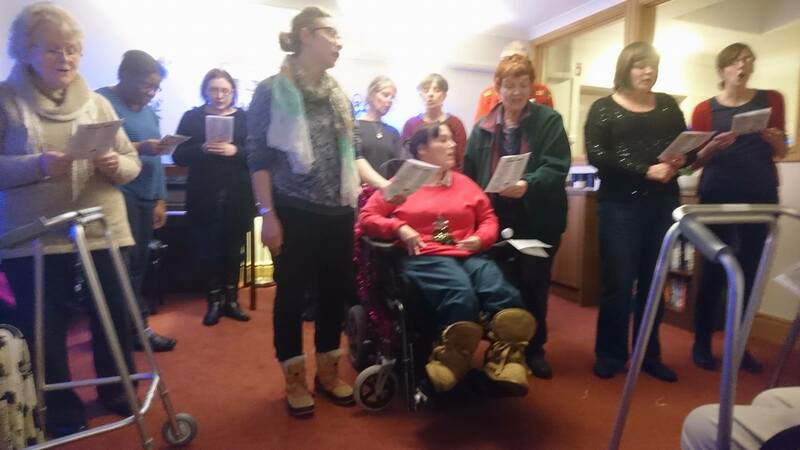 Lockleaze’s new singing group gave their first public performances in the run up to Christmas. Their first showing was at the Lantern Parade and Christmas Tree lights switch-on event in Gainsborough Square which was followed a few days later by a performance at Katherine House, a residential care home in Westbury-On-Trym. A total of 25 residents watched and joined in too and their rendition of the twelve days of Christmas (with actions) will long live in the memory of everyone who was there. It has been recognised that singing lowers stress levels. Making music in any form is relaxing and singing releases stored muscle tension and decreases the levels of a stress hormone called cortisol in your bloodstream. Singing improves mental alertness, improved blood circulation and an oxygenated blood stream allows more oxygen to reach the brain. And by singing a group there is safety in numbers! The group was et up by Sam Parker it late July. Sam says, “After talking to people over two years, I met lots of people who wanted to join a singing group but nobody was able to commit to establishing one. Until I spoke to Rachel, Maria and Angela that was! It was really them who set up the group, not me. I supported them initially by finding them a free of charge venue to meet and printing lyrics etc. The group is led and owned by its members and has gone from strength to strength! At the first meeting in July three members attended. At the end of September meeting we had 40 people! St Mary’s Church continue to offer the venue free of charge, members bring in cd’s to sing along to and donate paper for the copying of lyrics. I think people are getting a lot out of being in the singing group – friendship, confidence and overall Fun! I think the group has definitely met its original aims as above. Angela Thomas adds, “I moved to Lockleaze 5 years ago and didn't really feel part of the community given the hours I worked. I had a spark of interest straight away when I saw the posting asking if anyone would be interested in joining a singing for well being group, what luck it also fitted around my working hours, and with no hesitation I made my interest known. I now feel part of this community and have met some lovely people who like me, enjoy our impromptu renditions of songs being sung in a variety of keys with much laughter ........ singing for wellbeing, no talent required is exactly what it says on the tin”. Maria Perrett says, “I've always liked to sing-especially when I need to get through chores and when im at work when we're busy and I'm aware it makes the task easier and gets done a lot quicker whilst it lifts my mood-usually customers join in too! As I've got older I don't socialise as much and was looking for something fun and affordable to do which didn't involve drinking or traveling too far. I started to ask around and was pleasantly surprised to find other people were enthusiastic about setting up a local singing group. Sam and Hayley from the hub organised the venue and poster and we began to spread the word. With no formal training or skills but loads of enthusiasm each week between 12 and 25 of us get together to sing our favourite songs and each week i finish the session laughing and smiling, feeling 're energized. I've met some great people, performed in public and rediscovered that doing something fun really does make you feel good”. The group meet at St Mary’s Church in Gainsborough Square at 6.30pm every Thursday and new members will be made to feel very welcome and as Angela says no talent is required.